"The Elk Spring Beverage Company was established in 1921 by John F. Drinkwater, Sr. at the corner of Lowell and Vernon Streets. The company grew from a small beginning to become one of the leading soft drink bottling plants in the vicinity. Elk Spring produced 'all season soft beverages of quality and wholesomeness.' The beverages were manufactured from pure spring water procured from a well which was driven 250 feet deep, and only the highest grade extracts and juices were used. The company boasted a manufacturing process which was the finest and cleanest of its sort, with unexcelled ingredients and bottles which were washed by machine. This allowed a 10-minute sterilization period before going to the filler. With the repeal of Prohibition, the company expanded to meet the times and added the distribution of malt products to their business. 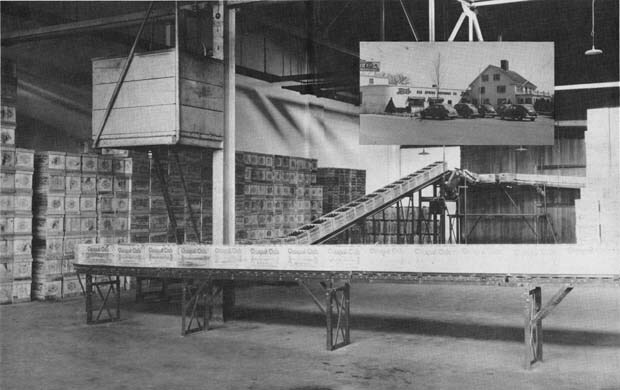 The company became a wholesale distributor of Pabst Blue Ribbon beer and ale and Pickwick Ale, which created further expansion of their facilities. Drinkwater retired in 1944 and left the management of the business to his five sons: Frank, John Jr., Benjamin, Patrick and Jeremiah. In 1961, the plant was enlarged through the razing of the family's home which was built in 1740, as well as a 'filling station' which was located at the front of the property." -- Text from calendar by Jayne M. D'Onofrio. Photo courtesy of Wakefield Item Company and Bourdon Studios. “Elk Spring Beverage Company, 1944,” NOBLE Digital Heritage, accessed April 22, 2019, https://digitalheritage.noblenet.org/noble/items/show/6932.